The definitive overview of the science and metallurgy of aluminum, magnesium, titanium and beryllium alloys, this is the only book available covering the background materials science, properties, manufacturing processes and applications of these key engineering metals in a single accessible volume. Use of these metals is now more widespread than ever, and they are routinely found in motor vehicles and aircraft. New material includes materials characteristics and applications; heat treatment properties; fabrication; microstructure/property relationships; new applications and processes. Reference text for senior undergraduates and postgraduates in materials sciences and physical metallurgy. The secondary market comprises materials engineers, metallurgists and engineers in industry, in particular in the automotive, aero and industrial components sectors. Ian Polmear is a graduate in Metallurgical Engineering from the University of Melbourne. After some brief experience in local industry, he joined the former Aeronauitcal Reseach Laboratories in Melbourne where he later became a Principal Research Scientist and Leader of the Aircraft Materials Group. Shortly after Monash University was established in 1961, he was appointed Professor of Materials Science and was Foundation Chairman of the Department of Materials Engineering. Before retiring in 1992, he served four years as Deputy Vice-Chancellor. His research interests have focused on precipitation phenomena in aluminium alloys, trace element effects, relationships between microstructure and mechanical properties, and the development of high strength aluminium alloys for aircraft. He has had visiting appointments in England, Switzerland and Japan and was the author of the first four editions of Light Alloys which were published between 1981 and 2006. Emeritus Professor Polmear is a Fellow of the Australian Academy of Technological Sciences and Engineering and an Honorary Fellow of the British Institute of Materials, Minerals and Mining. Fellow of the Australian Academy of Technological Sciences and Engineering and Honorary Fellow of the British Institute of Materials, Minerals and Mining. 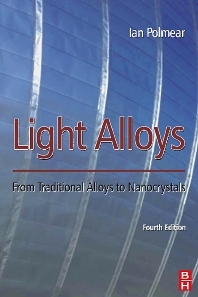 As the title, this book covers almost all necessary informations about light alloy. It would be a perfect book for all researchers towards light alloy.